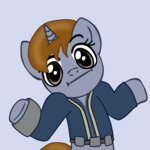 It is my pleasure to announce that we will be printing Mimezinga's Fallout Equestria Pink Eyes! One of the main five Fallout stories, Pink Eyes tells the story of the filly Puppysmiles as she journeys through the ravaged wasteland, 200 years after the bombs fell, in search for her mother. Throughout her journey, Puppy brings a touch of innocence to all the ponies rebuilding and scavenging in the hostile wasteland. This project is supported entirely by Fallout fans (that's you! ), so the process is a bit different than what you might be used to. Put simply, everyone signs up first, we then request quotes for all the books needed, and we divide the total across everyone who signed up. Next we'll send out invoices and after everyone pays we can start printing books. A few weeks later when they're all finished, we pack them up and ship them out to everyone! The books themselves will be dark green hardcovers with a foil-stamped title and spine. They'll be printed on 5.25"x8" paper and should look right at home on your bookshelf especially next to the larger FoE books. As for the cost, our estimates are based off around 500 people signing up, but the final cost will likely change a little bit depending on how many people actually sign up. Shipping will be about $6 for the US, $20 USD for Canada, and about $25 USD for everywhere else. As always, if you have any questions or concerns, post 'em here, hop onto the IRC channel, or email FOEPrintProject@gmail.com. I personally can be reached at zemming@zemming.org (but really, most stuff should be sent to the project email, not straight to me). Ohmygodohmygodohmygod yes!!! I love this story! This is fantastic! Glad you guys could fit in another round of printing! Thanks so much for all the effort ya'll put into these projects. Signups will be open through February 22nd. After that we'll probably open a waitlist like we did for the FoE printing. And you don't have to pay when you sign up. Invoices will be sent out shortly after signups close. I checked my email for a second, and my eyes widened and now I have to explain why theres gonna be another dark green hardcover book on my shelf. I'm excited, haven't read the story yet so I'm excited to wait. I'm gonna be so broke when Project Horizons gets a printing. Pink Eyes is a welcome surprise though! Will there be dust covers or will that be up in the air until the last moment like the last printing was? I also assume this is a one book print because of the relatively short length of the story? Guess my last question would be that since its all based on 500 people ordering, what would you say is the odds that goal will be met? I can pay for it even if it goes up from what the thing says, but I'm getting ready to head off to college this next year so I gotta make sure what I'm budgeting for.